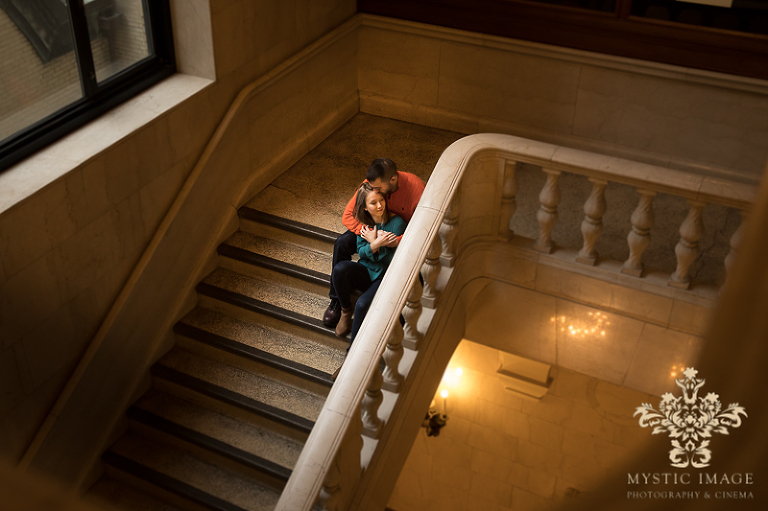 It was such a pleasure photographing Louisa and Matt’s engagement session at the Cleveland Public Library this past weekend. This soon-to-be wedded couple will be getting married later this year in June and I couldn’t be more excited to be working with these two. I can honestly say that they are an ideal match for one another in so many ways. They are both funny and easy going lovers of fitness and Dr. Who, but that’s not what makes them so perfect for one another. What really touched me was when I asked them, “So exactly how long into your relationship did you know that he/she was THE ONE” and both answered, without hesitation, “From the moment I met him/her.” Awe!!! But it wasn’t just their responses that resonated with me… it was the way that they looked at one another as they said it. You could see the deep and honest love that they share for one another. It was absolutely beautiful and made this photo shoot a truly enjoyable experience! Louisa and Matt, I cannot tell you how thrilled we are to be working with the two of you on your big day! We are going to have an absolute blast and I hope you enjoy these favorites from your engagement session that I’ve picked out as much as I do. Cheers!